Zappa.com • View topic - Which really came first -- Läther or the four separate LPs? Which really came first -- Läther or the four separate LPs? Post subject: Which really came first -- Läther or the four separate LPs? Here's the sequence of events that I've presumed to be correct for years: In the spring of '77, Frank gave the master tapes of a four-LP boxed set titled Läther to Warner Bros, which either refused to release it or decided that Frank shouldn't be paid the amount contractually owed to him for four albums. Apparently, someone at Warner (possibly Mo Ostin) stupidly thought that Frank, of all people, had thrown the set together without much thought beyond quickly fulfilling his remaining requirements and freeing himself from the label. Warner spitefully threatened EMI with a lawsuit, scaring them out of negotiations. Frank then offered his eight-sided album to Mercury/Phonogram, which was to press and distribute the set as the first release on Zappa Records. After it had gone through the test-pressing phase and had even been assigned a catalogue number, M/P suddenly refused to distribute it, as someone there had noticed its "offensive lyrics." Frank finally resorted to splitting Läther into four separate albums, leaving out all linking transitions. He also added a few songs and omitted others. The transitions, as well as re-recorded versions of the excluded songs, would see the light of day on forthcoming albums. 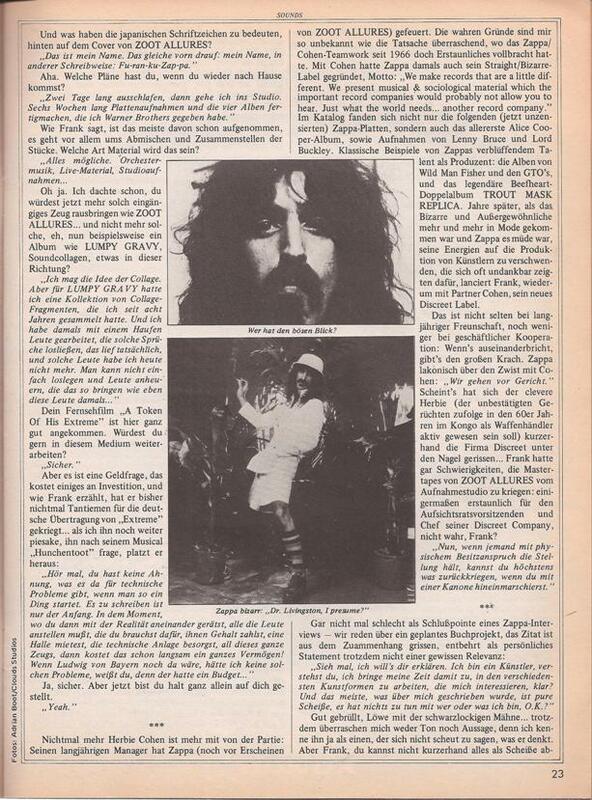 He gave Warner the first Läther-ette, Zappa in New York, with artwork and gatefold notes that were preserved when the company finally released that double album on Zappa's subsidiary, DiscReet. He then delivered the other three, fulfilling his contractual obligations anyway, at least as far as he was concerned. Whether he planned to hand over the cover artwork and musician credits for the latter three upon being paid for them, or rather, submitted designs that were ignored by Warner, the three were ultimately issued with covers that he hadn't approved, no liner notes or musician credits, and even some misspelled / inaccurate titles (the most glaring being Warner's album-name change from Hot Rats III to Sleep Dirt). Before Warner could begin these staggered releases, Frank played Läther in its entirety on KROQ-FM (Burbank-Pasedena, CA), encouraging listeners to tape it. I've always believed that the conflicting story -- that the four separate albums came first, to be rearranged into Läther after Frank realized that Warner wasn't going to pay him fairly -- isn't true, mainly because of Gail's booklet notes in the '96 triple CD: "As originally conceived by Frank, Läther was always a 4-record box set. One more time for the world: Läther was always a 4-record box set." Does anyone know of any Frank quotes that support either story? He always seemed to be vague about which came first, Läther or the Läther-ettes. His comments on the radio station mentioned above were very general: "Warner doesn't have the rights to this material" and "Warner Bros. is trying to wreck my career." In the spring of '79, he told Record Review about the wrongly titled Sleep Dirt, and that the cheesy album cover was "just another snide attempt to undermine the merchandising of it. If you saw an album sitting in the rack with the title Sleep Dirt on it, you probably wouldn't be too intrigued by it. And based on the job they did with the cover of Studio Tan, they made [all of the packaging] as unappealing as possible." That's about all I've found, apart from the occasional comment about Warner's failure to pay him for the four albums. 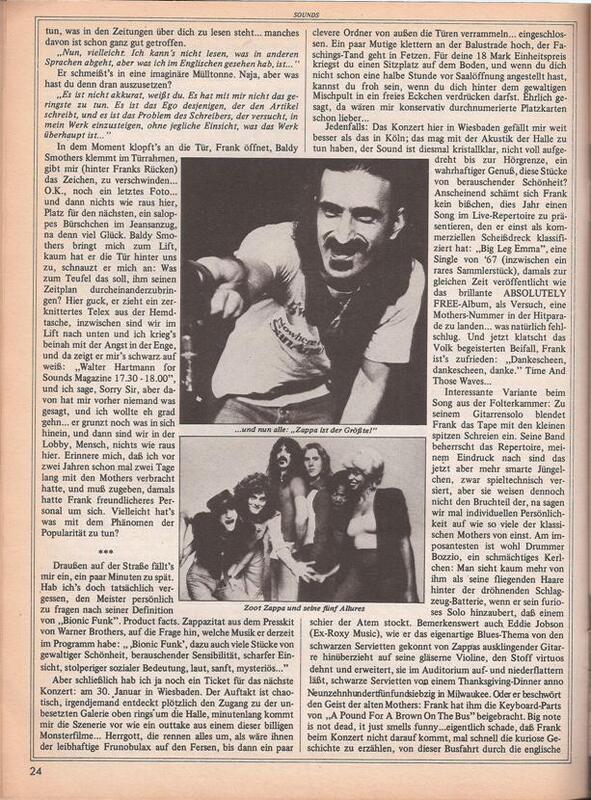 One thing I remember from those days: In an interview with a german magazine in 1977/78 he mentioned having to complete 3 or 4 separate albums for Warner Bros. No word about a box set. 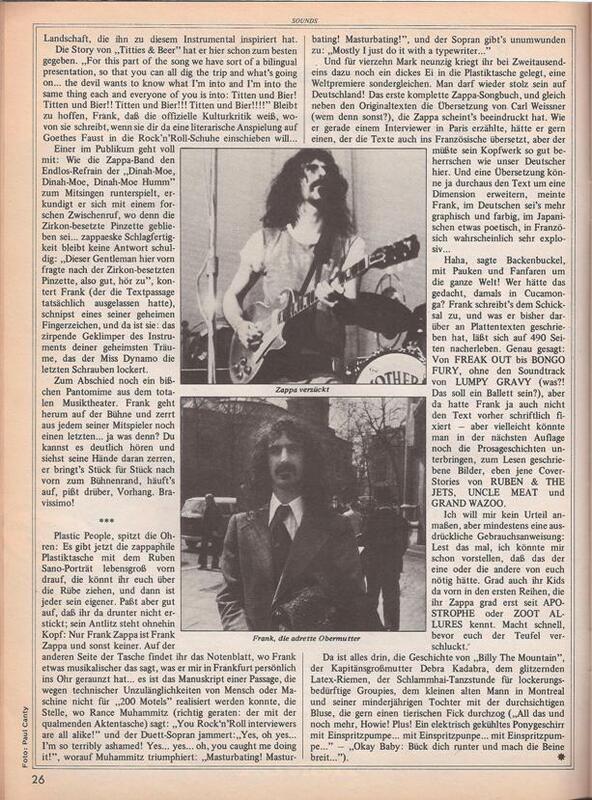 The interview was either conducted during the early 1977 european tour or the early 1978 tour, probably published in the german magazine "Sounds". Maybe someone can remember more accurately and/or provide a source. In my opinion there is no doubt that Zappa first created four separate albums, each very much a complete project with its own identity, before scrambling them all up into Läther. Note that when he created Läther he made shorter edits of many of the tracks and took the opportunity to add in some new material--all of it more recent than the recordings on the separate albums--I believe that this is more consistent with the separate albums coming first. Gail's claim that "Läther was always a 4-record box set" is weirdly tautological. Sure it was--but what about before it was Läther? My theory is that FZ delivered ZINY as his new album complete with artwork. When WB objected to Punky's Whips FZ wanted to get out of his contract by delivering the 3 Panter albums (sleeve designed by Gary Panter). 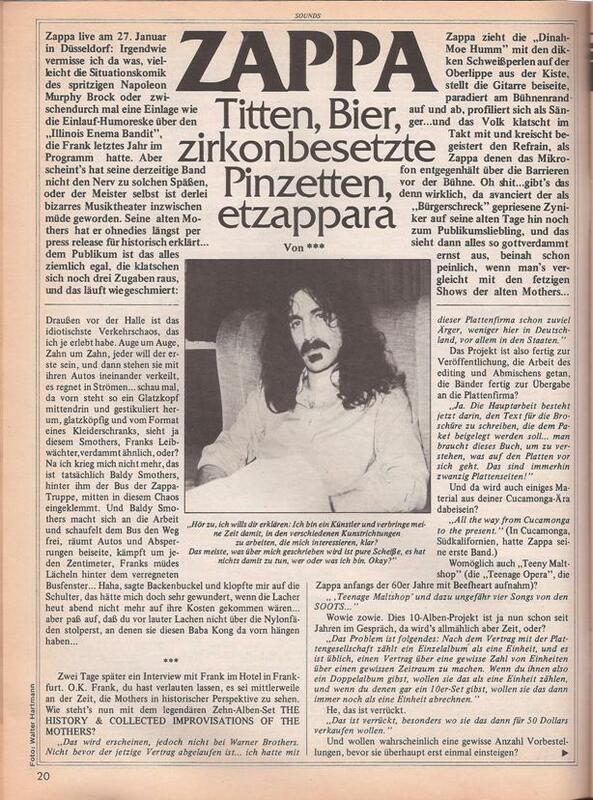 When ZINY wasn't released within 6 weeks of delivery as per FZ's contract and the other 3 albums were rejected (pssibly because 'no sane human being could make 3 marketable albums at once'?) FZ re-edited the whole lot into Lather. The title Lather was always attached to a 4 LP boxed set but says nothing about what came before it. 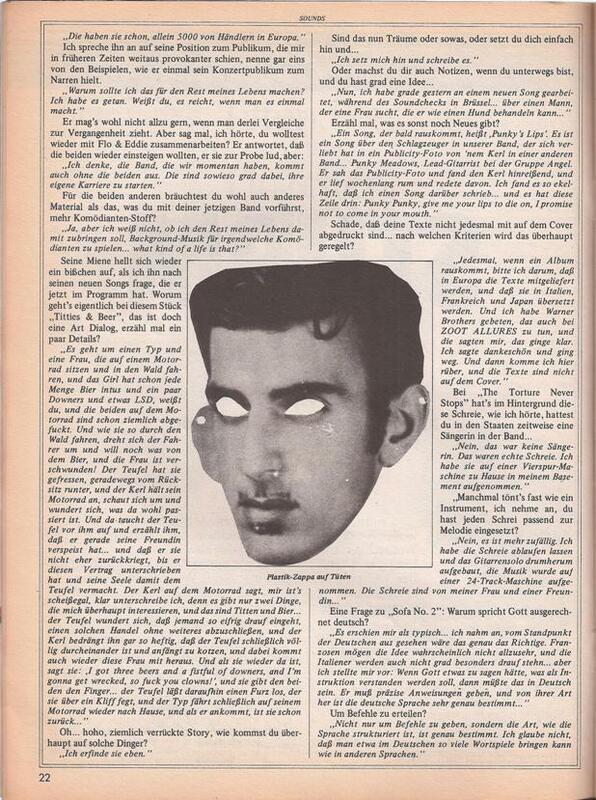 FZ didn't bother spending time on the sleeve design of the Panter albums because he just wanted out of his contract. That's a really good point -- I guess it's not exactly saying much, is it! I admit that the other theories above are at least as good as mine. In fact, the point about later material being included supports the "four albums first" case more than Gail's comment doesn't. It is also possible that he compiled both versions simultaneously (the box and the individual albums), because he knew of the difficulties with Warner Bros. in advance and wanted to be prepared to have something to offer to other companies. I grew up in LA and lived there until 1992, KROQ was always the hippest station of all and we listened to it 24/7...I used to sleep with my radio on all night until I moved in with my future wife in 1980. I remember when Frank came on and played this, it was a big deal for the LA music scene and there was a buzz about this amazing 4 album set. I lean towards the 4 album set came first, because Frank was always pushing the envelope of what the norm was. I think though that when his original concept album was not excepted or published and Frank had to re-package it into 4 individual albums that changed everything. I agree that he would have done additional work and changes to the 4 album set, because as I see it Franks Conceptual Continuity meant to work was never truly completed. The ultimate proof of which came first must certainly exist in the Vault and this question I am sure could be answered by those working on the archival material, a good start would be to see the package he delivered to Warner Brothers originally which I assume can be dated and then compare it to the 4 individual packages that were delivered to them to see which out dates the other. Another point made above that seems to work towards the 4 came first concept would be lack of finished product (no artwork liner notes) on 3 of the 4 individual works, as again I even though Frank was always adding and tweaking his work constantly, he would never have handed it over to Warner brothers in some unfinished form even if that was to change a little or a lot by the time it was issued. in 1979? Another question comes up. When did Frank play Leather on the radio? That's it! Thanks! 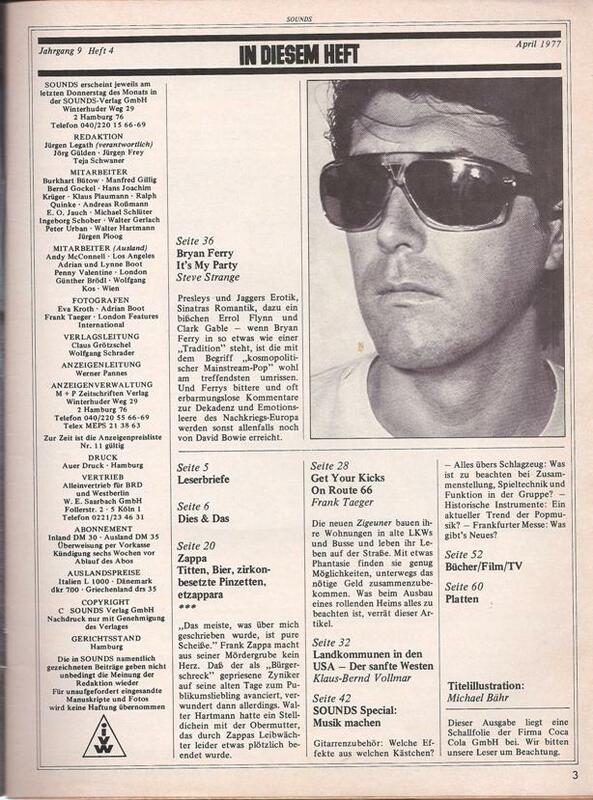 So this interview only says that in early 1977 he was to finish "4 albums" for Warner Bros. No evidence if it is a box set or separate albums. No mention of titles. Interestingly, he says "finishing the 4 albums I have given to Warner Brothers". So he is still working on 4 albums he has already given to WB before? We don't know about the accuracy of the translation into German, BTW. When did Frank play Leather on the radio? If he originally gave them a Box set and they declined and he had to rework the material into 4 albums that statement would still be true would it not? The "Sounds" interview was conducted during the early 1977 European tour. Läther as we know it contains material from that tour. So Läther must have been compiled after the tour and after that interview. In that light the 4 albums he is talking about most likely came first and then Läther. The "Sounds" interview was conducted during the early 1977 European tour. Läther as we know it contains material from that tour. Is that where those early versions of "Tryin' to Grow a Chin" and "Broken Hearts Are for Assholes" came from? I concede that the version we have of Lather is not the original and it was re-worked as I said below "I agree that he would have done additional work and changes to the 4 album set, because as I see it Franks Conceptual Continuity meant to work was never truly completed"...I don't see any reason both could not be true, I still believe the following from above... "he ultimate proof of which came first must certainly exist in the Vault and this question I am sure could be answered by those working on the archival material, a good start would be to see the package he delivered to Warner Brothers originally which I assume can be dated and then compare it to the 4 individual packages that were delivered to them to see which out dates the other." Yes. London and parts from Cologne. True. I think we are dealing with a very narrow timeframe. Both versions (4 albums and the boxset) could have been completed at the same time. Also interesting in this context: as far as I know the overdubs for the Zappa In New York tracks were done ca. April 1977. So ZINY and Läther as we know them can't have been completed before that time. From a listener only point of view, I'd say the Lather album came first as it makes more musical sense and provides terrific contrast between tracks. The only issue is of course that the Ryko release which is evidently the whole shebang(the new ZFT version has tracks missing correct? ), was the best possible versions of the tracks all spliced together to deliver the best possible version of the album however there not all the original 2 track broadcast version. If Simon Prentis has anything to say about it, the first release was in December 1977 via direct broadcast to radio and I'd love to hear all those fans who actually had there tape recorders ready for that one. What was the original album actually like in comparison to the Ryko box set which is essentially the best possible versions from the vault all pieced together to reflect the original 8 sided album notes that Frank had stored? In any case, I like listening to the entire Lather album as opposed to the 4 separate albums. I have the 4 separate albums(of course,) because they have different versions of the tracks and are nice sometimes depending on what styles I feel like listening to. Most of the time it's Lather though without a doubt. Thank you so much for sharing. I guess station KROO wouldn't have recorded it by chance for there archives? Please do share. Was the broadcast version markedly different from what eventually became the 'Ryko' 3 CD set release? I understand this certainly would have been a 'little' while ago but music can often have an amazing way of remaining a vivid memory. It would be very interesting to know what you thought at the time compared to now and if the eventual release on CD was better than what you remembered or if it lacked what you heard originally. Sadly in the Ryko 3 CD set I have, it just shows the sheets which would have been the track listing for each side of the records in the set. (Someone in the US of A please do let me know if the American release had extra details.) There's a printed statement that the pieces were recorded between 1973 and 1977 but no other clues as to exact proof of dates. Something I can add is what Ruth Underwood declared to Terry Bozzio(from 'The Drummers Of Frank Zappa' DVD) who when he was auditioning mentioned that Frank played him several of the new pieces he wanted him to play and new stuff like 'The Adventures Of Gregory Peckory' and a number of other tracks from the time of Lather. Ruth corrects him and declares that the pieces he mentioned were not not new and that she had heard and even played a lot of them. This certainly supports the 8 sided Lather album coming first idea. Terry joined the band in 1975 right? (Further proof the material was already in the pipeline like Ruth declared) The album 'Zappa In New York' was released in 1977 which consisted of live performances of new tracks, so Frank had already written this music and probably had put together some kind of recording. Then the albums Studio Tan, Sleep Dirt and Orchestral favorites came out in 1978 and 1979 correct? If frank released the 8 sided album with all that material in December 1977, then surely the 8 sided album came first simply by album release dates. I guess the proof in the pudding would be the listeners of the actual radio broadcast. Can they recall if the tracks which feature on Zappa in New York were exactly like the one on the broadcast or if they were completely different we would have a definite answer. If they were in fact different then without a doubt Frank must have already had the material and wanted to release it. However for what ever reason the record company must have believed it was more profitable and less costly for them to produce 4 separate albums as per there contract instead of 1 massive album. For years before the ZFT finally released "Lather," I had to settle listening to the radio version. I originally got it on 2 cassette tapes. I have no idea what generation were talking here. may be a different ( or is it edited differently?) version than what's on the ZFT release. The guitar solo sounds different to me. I really have to go back and re-listen to both version to be sure.